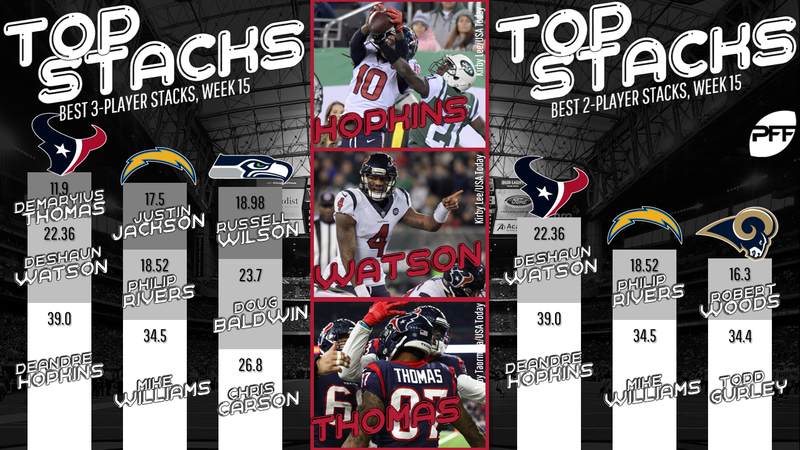 It’s DFS tournament season and everybody wants in on the fantasy football action in Week 15. Whether you’re about to join the Millionaire Maker or a single-entry tournament, it’s important to consider the stacking strategy. The Chiefs matchup is a great one to get Seahawks offensive coordinator Brian Schottenheimer out of his comfort zone, as the Seattle defense will have some trouble slowing down Kansas City’s offense. This is good news for Wilson and the rest of this stack. The Chiefs have allowed the fifth-most fantasy points to opposing quarterbacks and second-most to running backs. Carson’s volume is as locked in as his red-zone role and Baldwin showed signs of life with two touchdowns and a healthy look in Week 15. This game has the second-highest over/under and PFF Greenline projects the over to hit.